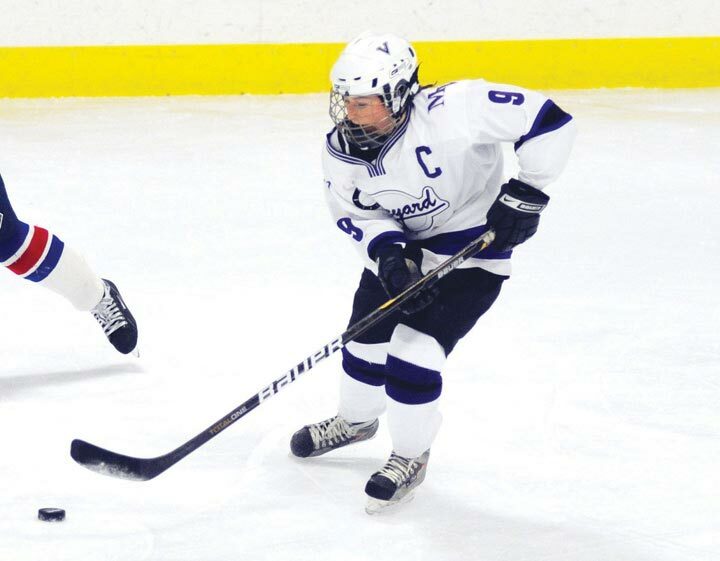 Celia Mercier scored five times as the Vineyard girls hockey team skated past Cohasset/Hanover 6-1 at Hingham on Monday. Celia scored the game’s first goal, the only one in the first period, at 12:06, assisted by Emily Cimeno and Maggie Johnson. Lizzie Kelleher found the back of the net just 22 seconds into the second period, assisted by Emily Cimeno and Tayla Kuehne. Mercier’s second goal was aided and abetted by Johnson and Kassidy Bettencourt. Mercier had a hat trick in the third period, assisted by Aubrey Ashmun, Kuehne, Cimeno, and Johnson. M.V. goaltender Texe Craig stopped 15 of 16 shots. The Vineyard girls peppered C/H goalie Kesli Locutt 34 times. The two teams meet again at the Arena this Saturday at 1 pm.